thread to keep things on track. using 60FPS and having the FPS erratically jump around. simple major city walk through and I obviously cannot test either of those at the moment... maybe one day. resolution in full screen if you want to see everything that was happening. This discussion is open to any and all that feel the need to ask any questions about 10 boxing or whatever. some 10 boxers post their specs and add to this. opposed to just stating what you think you might be getting. code which can easily skew any real and up-to-date information. most likely hinder test results. Pheh. Pop another 580 3GB in and rock on. the 2nd video peektime on your realm? I like the video feed use. Stormwind doesn't seem that busy, for a peak hours. I'm used to far more people crowding its streets. Ten boxing is even neater than five boxing. someone has been successful in doing so I'd like to know (A GPU-Z screenshot would be great). Stormwind's... perhaps I should have created a Horde team instead (I like my Human Females, though). the High populated realms, although Horde does have more among their ranks. far and put a transition in the video if the venture wasn't worth it. Last edited by MiRai : 06-09-2011 at 07:27 PM Reason: Forgot About Sajuuk! Excellent. 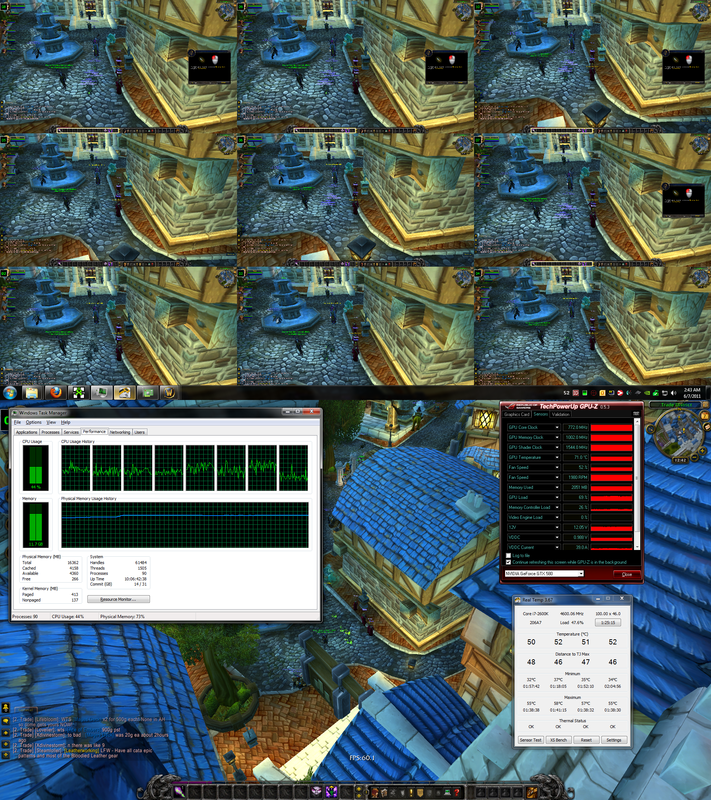 I am amazed that you can render 10 screens at the full resolution with a single gpu, although a very good one. Clearly the 3G option is paying off as well. Your switching is still a bit (not much though) worse then my alt/tab method but then again you can see all 10 of your characters whereas I can only see 6 of mine at a time (one per computer). But I can see in full screen and don't have to pip in and out to do things with those characters. But my system requires 6 1920X1200 monitors whereas yours only needs one or two. Ya well I guess there isn't much more to be said, for 10 boxing the 580 3G is the best (and I don't think that duel gpu is going to help you that much in wow, nor will duel cards). Spin / Fly around Test (all about the same) Nvidia440 3GVideoRam 5 Clients (4 in background on lowest options); I play full screen 1920 X 1200. Spin / Fly Around / Stationary Test (all about the same) Nvidia460 1GVideoRam 5 Clients (4 in background on lowest options); I play full screen 1920 X 1200. Its fairly clear that going over 10 boxing on one computer isnt going to happen, as you were close to the 3G max as it is. I notice that the GPU and Memory controller loads are relativly low, meaning it might be possible to get by with a bit weaker gpu (although we need to know if you were runniing full ultra in the main), if you can find one with 3G. And it does seem like the CPU is getting a real workout as well so maybe CPU needs be stonger then what I would have thought. 10 new Horde tonight and take them into Orgrimmar... this should be exciting. I am definitely happy I went with the 3GB route. swap instead of that delayed one. It's mainly the Texture Resolution and Shadows that I will need to adjust. Ok after spending the last couple of hours looking up video cards it seems there is little choice for 5 or 10 boxing.